The British Gazette » Those who the Gods wish to Destroy……. 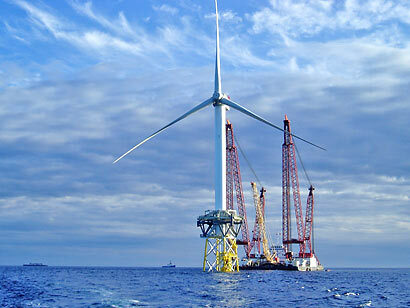 The large offshore wind turbine pictured – maximum output 5 Mega-Watts – will according to historical measures of wind speeds at its North Sea location, is expected to generate its rated output 38% of the time. They would need 800 of these to generate the same Mega-Wattage as Drax power station – but then only for 38% of the time. Apart from deciding who should be in the running for the new post of Head of State of the European Union, the politicians from the EU’s vassals sought an agreement on how much taxpayers money they should offer to give away at the forthcoming Copenhagen Summit in December. Messrs. Brown and Miliband said agreement had been reached “….on financing to help developing countries combat the effects of global warming….” But others spoke of a rift between countries in east and west Europe. The international talks in Copenhagen to formulate a successor to the Kyoto Protocol, the United Nations’ climate change fix scheme, which expires in 2012. Large amounts of money is cruicial for the warmists at Copenhagen because developing countries say they will not “….sign up to tackling climate change….” without enough money from developed nations. The 27 EU vassals were preparing to back an estimate that developing nations need 100 billion Euros ($148 billion) A YEAR by 2020 to “….tackle climate problems….” However EU countries in eastern Europe want to know how much they will have to stump up. “….the EU will be pioneering in this respect. However, the commitments will also be tied to other countries making similar financial pledges….” Angela Merkel said. Of course if Brown, Miliband et al get their way, huge amounts of taxpayer’s money is going to be squandered away to counter a danger that is not there. The British people are already being forced to part with more cash to pay for electricity generated by hugely expensive windmills and not the economical coal fired power stations. Food bills are also set to rise as another result of this folly as it has been determined by the idiots running the country that the 4,000 Mega Watt Drax power station should obtain one eighth of its fuel from “biomass” – wood to you and me. One eighth may not sound much but this is a vast quantity. Highly efficient though Drax is, its fuel demands are vast. Coal trains ply regularly to keep its bunkers full. To match the calorific value of a ton of coal many tons of wood are needed. Where are they going to get the wood ? Well apart from having to scrat around virtually every industrial estate to collect as many used pallets as they can they are going to grow it – large areas of previously productive farmland is going to be put down to growing willow bushes! Of course arable and pastureland used for willow bushes can no longer produce food. Thus we will have to import more. From a world with a rapidly expanding population. Just to avoid burning the coal we already have under our own feet! Those who the Gods wish to Destroy – they first make mad. Welcome to the U.K.L.A. (United Kingdom Lunatic Asylum).